Monday, June 17, 5:00-6:30 p.m.
Join us Monday evening for a networking reception sponsored by Mayo Clinic! Appetizers and entertainment will be available while conference attendees, students, speakers, and exhibitors network. Organizations focusing on mental illnesses and addressing the stigma will exhibit around the ballroom. 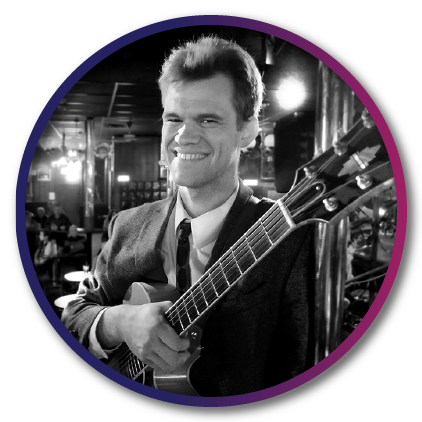 Sam Miltich and his jazz band present "The Improvised Life: Exploring Intersections of Mental Health & Creativity through Jazz," a program highlighting cultural contributions of famous artists with mental illness and inspiring hope through Sam's own story and original compositions. Sam's dialogue explores intersections of mental health and the creative process and his pursuit of well-being amidst the daily challenges of living with a serious mental illness. He will describe his definition of recovery and the sense of purpose he cultivates through quality engagement in career and family life. Backed by a world class band consisting of Dave Karr (tenor sax), Chris Bates (bass), and Nathan Norman (drums), the tour expands exposure to jazz in rural communities and increases awareness of the issues faced by a vulnerable population. Connect with students from the University of Minnesota Medical School Duluth Campus as well as other health professional students. Over 60 first-year medical students will present posters at the reception. Browse the posters in the ballroom and hear students answer questions and speak to their posters.